The sultry rhythms fill the air, as low lights and hard drinks complete the atmosphere at one of Latin Jazz’s newest homes, in one of the city’s most storied neighborhoods, El Barrio, Spanish Harlem, NY. Here at the new FB Lounge, I sat down with Aida Ruiz, daughter of the late pianist Hilton Ruiz. Over a bowl of asopao de guándules (pigeon pea stew) and on what should have been Mr. Ruiz’ 56th birthday, Aida and I spoke about her father, their relationship, his career in music and lastly his mysterious and untimely death. The emotion in her voice was palpable as was the intensity emanating from her eyes. Aida spoke with the vigor of a proud daughter, smiling and hand gesturing in that way so common of Latinos. However, there was a definite sadness in her voice, along with a distinct underlying tone of anger: no doubt of being the daughter of a father who was taken from her, far too soon and far too violently. “He was the person that would show you new things, open up your eyes to new possibilities. Yes you can do it; yes you can go to Israel, to Nice (France), to Monaco. Yes, you are Puerto Rican and you should be proud of being Puerto Rican, but you can do the things that maybe you wouldn’t necessarily think of doing,” she recalls. Apparently Hilton led by example, pushing the conventional envelope by testing boundaries and obliterating borders in Jazz music whenever possible. Born in New York City on May 29th, 1952, Hilton Ruiz spent his formative years in an area of Manhattan known as “Hell’s Kitchen” (more recently referred to as the ‘nearly not as cool sounding “Theater District”’). As a child, Ruiz stumbled upon jazz in an unusual way. Back in the 1950’s many animated cartoons featured scores composed and performed by Jazz musicians, more specifically the legendary Duke Ellington. It was Ellington’s captivating tunes that caught the ear of this budding miniature musician. 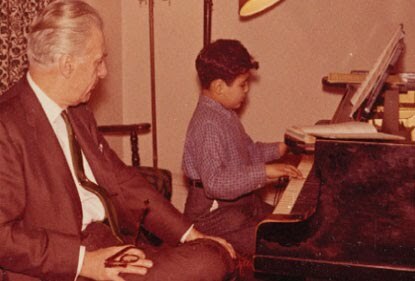 Though he would not embrace Jazz for some years to come, at 5 yearsold Hilton had indeed begun to demonstrate an interest in one of the most important instruments used in the genre; the piano. His mother, Carmen Ruiz encouraged his desire to learn and with meager resources, the hardworking single-mother bought her son his first piano. Hilton immediately began taking piano lessons at the age of 6 with a man by the name of Santiago Mesorana. Mesorana became one of the first people to mentor and cultivate the young musician. He taught him the mechanics and fundamentals of playing, reading and arranging music in a classical form. The hard work paid off, as at the impressive age of 8 years old, Hilton Ruiz was invited to perform a solo piano recital at the prestigious Carnegie Hall. In front of a packed house, the young Ruiz performed pieces by the masters of classical music, like Mozart and Chopin. This only added fuel to the young boy’s fiery passion and he continued to hone his craft, by practicing wherever and whenever possible. The atmosphere of the FB Lounge began to change as the hour grew later. The band had begun to arrive and set up their instruments. The Lounge was getting ready for another night of beautiful rhythmic fusion, and as the background music increased in volume I asked Aida to tell me more about the cultivation of her father’s love affair with Jazz music. As an adolescent, something started to change in Hilton. A deep hankering for the thick and melodic sounds of Jazz kept tugging at the strings of his musical heart. Ruiz was destined to be a jazz pianist, and with the fundamentals of the instrument under his belt—he began to seek the help and mentorship of jazz pioneers like Cedar Walton and Mary Lou Williams. However studying would only get Ruiz so far. Eventually he would have to break down the age barriers that kept him out of most Jazz clubs. Therefore by the mid 60’s, Hilton at the age of 13 or 14—was trying his best to sneak into jam sessions all over New York City. He was constantly turned away—but that did not stop him from jamming with musicians outside venue doors. At age 15 he made his first recording with a New York based Latin fusion band, known as Ray Jay and the Eastsiders. 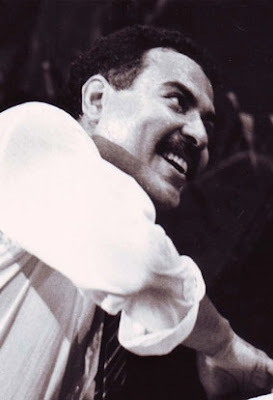 In the pre- Fania Latin music era, the “Eastsiders” had just begun to meld the traditional-style salsa coming out of Puerto Rico, with Afro-Cuban rhythms and a gritty hard-hitting New York City sound. Ruiz continued to play with the “Eastsiders” for the next three years, occasionally lending his talents elsewhere. After graduating from the now-defunct Power High School in Manhattan, Hilton decided to venture overseas. The year was now 1970, and with the country still enamored with Rock n’ Roll and flirting with the contagious Disco fever, Jazz had to take a backseat. Conversely, the Jazz scene in Europe was thriving and musicians were heading across the vast pond in large numbers to find new gigs in the Old World. By the age of 18, Hilton along with a group of fellow musicians jumped on a plane to Europe. Rahsaan Roland Kirk was a well-known Jazz musician who had long established himself in the Jazz circuit and played with greats like Charles Mingus and Herbie Hancock. He also recorded with musical pioneer, Quincy Jones. Though Hilton toured Europe for the first time at 18, he went back a countless number of times throughout his career, taking over 30 trips alone with Kirk, who would eventually pass away in 1977 at the age of 41. The clinking glasses and not-so-quiet murmur of voices thickened the air. We were way passed the asopao, and moved onto a more subtle salad. It was obvious that Aida enjoyed the art of storytelling. She appeared almost childlike in her candor as she relayed anecdotes about Hilton’s teenage years. The ambition shown by such a young man was indeed impressive and we continued to discuss Mr. Ruiz’s burgeoning career. “That was his first trip, but from then on he [Hilton] would come and go, staying on the road for about six weeks at a time,” she remembers. It seemed Hilton had a love/hate relationship with life on the road, but nevertheless his interest and passion for Jazz flourished both in Europe and in his many travels worldwide. “When Dad was asked for his favorite place to be in the world...he said, ‘On my couch watching TV, in my home in Teaneck New Jersey,’” she smiled. Perhaps Hilton’s affinity for home had to do with his family. According to Aida, Hilton would often bring back all kinds of gifts. There were shawls and fans for his mother, jewelry from all over the world for little Aidita and for his wife, French perfumes that had not yet hit the U.S. market. 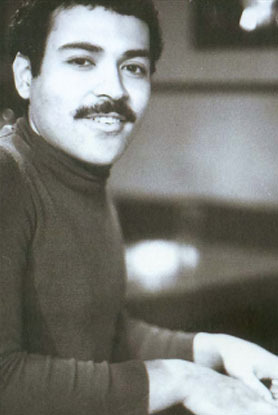 Hilton Ruiz met his future wife Aida Martinez at the very popular New York City hotspot, “The Cheetah” while performing as the pianist for Salsero, Ismael Rivera. Daughter Aida referred to her parents as “soul mates”; two people who met and fell in love at a young age and remained close even through their eventual divorce. Hilton was consumed by the need to help the people and the city to which he felt so connected. Not long after, Hilton spent three days working in the studio and came back with a lively and highly integrated production. Hilton was extremely excited about this project and when recordings wrapped in May of 2006, all that was left to do was finally head down to New Orleans to record some footage for the DVD component. The idea was to talk to people living in New Orleans and give the project a personal element. On May 18th, 2006 Hilton and a small crew boarded a plane and flew south to New Orleans to tour the French Quarter. “They arrived on the 18th and they toured the city. My father began to meet people on the street, and before long there was a crowd of people around him, he was having a ball,” says Aida, as her voice trails off. The slight quiver in the tone of Aida’s voice had returned, and for good reason. She was about to explain to the best of her ability what took place in the evening leading to her father’s injuries; Injuries so severe that he would never regain consciousness, injuries that would eventually take his life. What happened on the evening of May 18th remains unclear. Initial reports claimed that Hilton Ruiz had been found on May 19th around 3am. He was alone and unconscious, lying in a pool of blood on Bourbon Street. Ruiz had sustained severe head injuries and initially appeared to be the victim of some sort of brutal attack. He was taken to East Jefferson Hospital where he remained in a comatose state until June 6, 2006, the day he died. Oddly, the death of Hilton Ruiz remains a mystery for those closest to him while at the same time a closed cased for the City of New Orleans. The New Orleans Police Department ruled that his death was the result of an accidental fall. Surveillance cameras had captured Ruiz exiting his last known location, Club Utopia. He was stumbling and indeed fell on the infamous New Orleans Street. However, this determination directly contrasts the preliminary findings of both the Police Department and the doctors at the hospital who treated him. NOPD initially labeled Ruiz as an apparent assault victim and a member of the medical team who treated Ruiz stated that he perceived the injuries sustained were as a result of trauma to the face with a blunt object. Ruiz suffered multiple and severe facial fractures. “I didn’t recognize him, and I got there less than 48 hours after he was brought into the hospital. There was no way to have an open-casket funeral for my father without reconstructive surgery to his face,” remembers Aida. On May 19th a doctor from the East Jefferson hospital left Aida several voicemails, stating that her father was in critical condition. It is obvious that this was difficult for Aida. She appeared on the verge of tears as she recounted her determination to get to New Orleans right away—even though there were no direct flights at that time. Finally, after finding a 3-stop flight to New Orleans, Aida, along with her mother were headed south. “We traveled to New Orleans in a state of total chaos and panic...my Mom literally took off her shoes at La Guardia Airport, ran through the hallways with me chasing behind her picking up her shoes and went directly to the front desk to check in. The airline representative told her that she had to get in line and she explained that her husband was dying in New Orleans. The airline representative said that if the other passengers on line would let her get in front of them, she could check in. So my Mother turned around and announced to a crowd of 40 or more people, ‘PLEASE LET ME CHECK IN I HAVE TO GET TO MY HUSBAND, HE’S DYING IN NEW ORLEANS!’ and the entire crowd responded in unison, GO AHEAD!” Aida recalls. It took 10 hours to get to New Orleans that night. During one of the three layovers, Aida spoke with a New Orleans detective who told her that her father had been intoxicated and fallen on Bourbon Street. At the time Aida was relieved that it was “just a fall” and thanked the officer for getting her father medical attention. However gratitude soon changed to disbelief when she finally reached her father’s hospital bed. Though the New Orleans Police Department closed the case and ruled it an accident, the Ruiz family maintains their belief that Hilton was the victim of a brutal attack. They are currently taking the necessary legal steps to have the case re-opened and have the investigation intensified. Unfortunately, at this time no further details about the incident can be printed, out of respect for the Ruiz family and the case they are trying to build. Though she hasn’t been back to New Orleans since the incident, Aida says that she holds no resentment toward the city and the many people who were kind and helpful to her during the terrible ordeal. She still Article Imagebelieves that New Orleans is a great city and looks forward to returning there someday. Most importantly, Aida would like to share the music her father created throughout his life, and showcase his talent of blending rhythms and bringing people together from all over the world. She looks forward to hon oring his memory by exposing new ears to the music of her father, Hilton Ruiz. 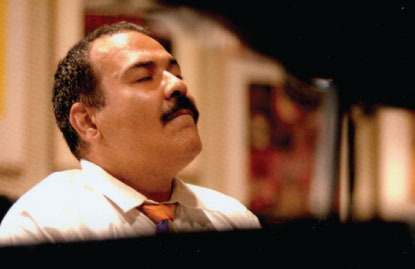 Perhaps larger in death than in life, Hilton Ruiz was a profound Jazz musician. His legacy continues through the constant work of his daughter Aida, and his irreplaceable compositions and valuable contributions to the art of music. Though his life was unjustly cut short, Ruiz’s talents and accomplishments continue to be remembered as the music and more notably the Jazz that will forever remain music and more notably the Jazz that will forever remain. Primeramente, considero más práctico que este escrito del finado Hilton Ruiz debería ser en español para gustar mejor su contenido. I first discovered Hilton Ruiz while going through a "latin jazz" phase a few years back. The first thing I remember thinking upon hearing him was, "this isn't just a great latin-jazz player...this is one of the best jazz pianists I've ever heard. Recently I've delved into his music once again and remain in awe of his talents. He is an inspiration to me as a musician. Perhaps someday there will be a book of his compositions... and maybe another volume containing transcriptions of some of his solos.